aside	Denny Reader talks to ASLI about his schizophrenia and using his creativity, saying “Its gives me a purpose and a platform to share my ideas and myself with the world around me”. Denny Reader, 33, from Leamington Spa, England describes his many artistic disciplines as outsider art, poetry, vlogging on youtube and music. For this issue of the ASLI magazine Denny submitted a visual art piece that he describes as a shamanic vision and has called ‘Gaia Is Awake’. Denny has lived in and around Leamington Spa all his life. He was diagnosed with schizophrenia at the age of 19, after some very tough times as a teenager, which later led him upon an intense spiritual journey and a deep psychotic breakdown. Denny tells us that art and poetry and Spirituality have been a lifesaver for him. Art and poetry have enabled him to express himself in ways he would never have been able to before, they have given him a purpose and a way to channel his emotions and energy, to share his mind with others and to release pent-up feelings that he cannot normally express. Denny has made Art since he was a child, and has written poetry too throughout his life. Denny tells us that he has struggled with his condition for 14 years, but has had large periods of wellness. It continues to haunt and disturb his life, but throughout it all he has endeavoured to remain creative and true to himself, though at times he has found this is very difficult. I have made Art since I was a child, I got a GCSE grade B in Art at high school, then went on to study Art and design GNVQ intermediate and advanced level at my local College after leaving high school. The piece of Art ‘Gaia Is Awake’ is inspired by a Shamanic vision I had when I was 17. It is the notion, the perception that the Earth, the Universe and the all the World around us, is aware of us in ways that we can never normally conceive of, it is aware and alive and knows of us, even though we are generally stuck in the mind of the human ego. Consciousness does exist outside of body and matter and watchful eyes and spirits see into our lives and minds, they know us! Years after having this Vision, I wished to bring it alive by making a piece of Art to depict it in the best way I could. ‘Gaia Is Awake’, is based on a Shamanic Vision of the World around us being more alive than what we can currently perceive and understand. The living Universe. Marc Chagall and Patrick Woodroffe have been a great inspiration to me over the years and also the likes of Salvador Dali and Giger. Outsider Art is a big interest of mine and inspiration for me also. Regarding Poetry, then mental health poetry (user/survivor) is my main inspiration. The people in my life inspire me the most, my very interesting friendship group, but artistically then I guess it’s local artists, outsider art and local artists I know. I am a big fan of Aboriginal and tribal Arts too. Also I am very politically aware these days, so the likes of Russell Brand, Owen Jones and environmentalists inspire me to be aware of the world around me and to know who’s pulling the strings. Also Spiritual speakers like David Wilcock inspire me too. I have been an active campaigner over the years in: mental health, animal rights, environmental issues, human rights, women’s rights and also am a keen follower of Survival international, this group fight for the rights of tribal people throughout the world for their homeland, their safety and culture to be protected. Well to me it sounds like a very accurate statement, literally people can find such purpose in art and creativity, that it gives them a reason to live and a vehicle on which to express themselves and channel the pain that life inevitably brings. It gives people purpose and also a break and a way out of situations and mindsets that result in so much struggle. Life is tough for so many, and Art and general creativity puts a break in the tough mundane reality that so many of us face day in and day out. Art can and does change perceptions, images have a powerful effect on us and Art can make us see things in ways that we just simply cannot perceive without this very valuable medium. The Artist can literally bring the viewer to a state of awareness and of a way of seeing things that generally no photograph or other medium can. 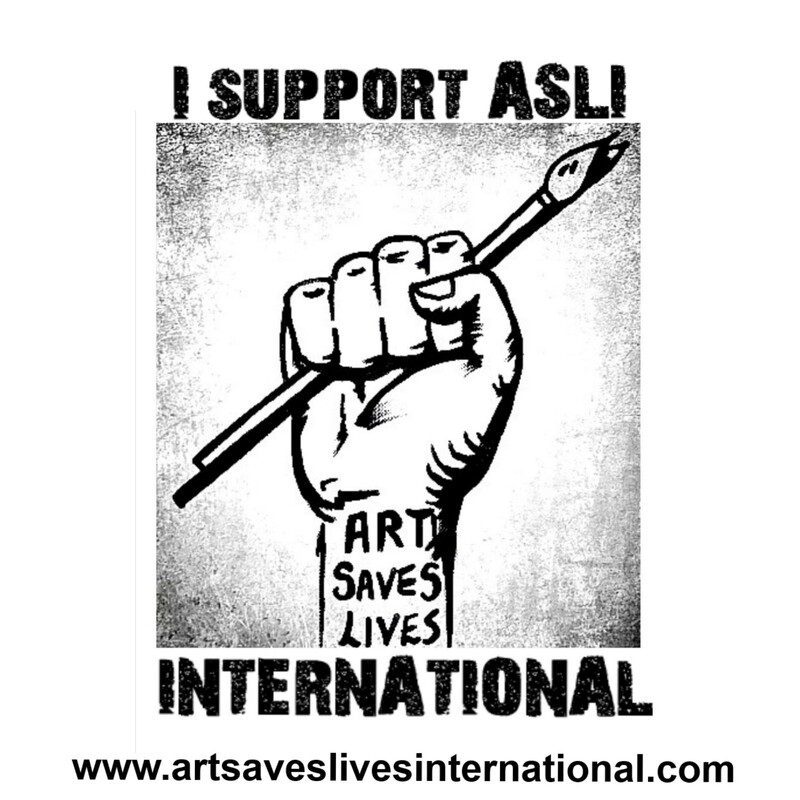 Have your artistic and creative outlets saved your life in any way and do you think your message within them could help create change in the world? Creating Art has given me a platform on which to share common ground with other people in my community, it’s given me a voice and a way to be heard and noticed. It’s given my life greater purpose and added to my sense of value, without that, god knows where I would be. I just hope to keep creating and keep making Art that people get something from and feel inspired by. I wish to open the minds of people and give them a different way of seeing the World. My initial beginning with schizophrenia started when I was 19. At the time I was heavily into fasting, psychic training, meditation and channelling, I had some amazing mind expanding experiences which really blew my mind and opened me up to so many new things. I got really into spirituality and was an avid researcher of different religions, spiritualities, faiths, the paranormal, life after death, out-of-body and near death experiences as well as mythologies throughout time. It all went very bad just after I hit my 19th birthday, I became very delusional and started living in the local woods of a nature reserve. I was regularly hearing the voices of what I believed to be the Gods, different entities and evil spirits and demons, I was going through a massive spiritual battle it felt and for the next year and a half I lived on the streets and in the woods battling it all in my head. After much psychosis, bizarre behaviour, and trauma, I was then later sectioned at the age of 21 and sent to the local psychiatric hospital where I stayed for the first time for four months. I have battled with my condition on and off since then, with a big variety of symptoms, but I have had some great support over the years by various professionals and some great people in my life, like my girlfriend, family and friends that have stuck by me through all my mad and dark times. I was later given a dual diagnosis in 2014 as also suffering from the ‘O’ of OCD, which I still currently struggle with as well as other more typical schizophrenic symptoms. Its gives me a purpose and a platform to share my ideas and myself with the World around me. It helps me to feel expressed and the whole process of creating Art is very therapeutic whether people like the finished product or not, it’s just great to create things, to enjoy the process but also to give and portray an idea, a new way of seeing things in life. It also gives me a sense of accomplishment and a way of expressing difficult emotions, to channel oneself into it and have something physical at the end of it too, helps to make one feel more content and accomplished. I think people can judge very quickly without knowing what the person is going through or have been through. I have felt rejected by lots of people who dismiss me before they know me, because of my condition and its stigma. 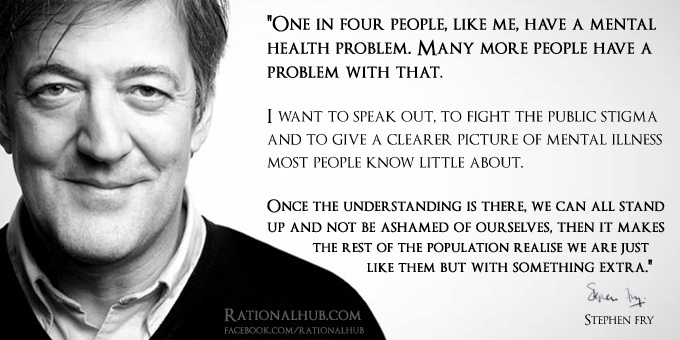 Also having a mental health issue often results in us being different and people love to judge those who don’t fit in. All the treatment I have ever received has been state funded except for some counselling I received from an organisation called Relate. The rest, well I have been in the system for over 12 years, in that time I have been hospitalised three times, seen a psychiatrist since 2001, had numerous psychiatric nurses, social workers and psychotherapy by two different psychologists. Some of the CPN’s I have seen have been really great, and my first psychologist really helped me through a rough patch. Support workers can vary greatly, depending on the way they see you really and obviously the quality of the person and their commitment or lack of commitment for caring for you and being decent. I have had some great experiences with some CPN’s and social workers and some not so good experiences with others. I currently receive no support except from a psychiatrist right now, but he is a good one and has been good with me so far. Generally in society I feel most people just don’t understand the complexities of mental illness, more people are aware of depression now and other conditions, but generally I feel that there is still much stigma. The media are to blame for a lot of what most people think, displaying for example most articles of people with schizophrenia as murderers and psychos who are a danger to people. But many of my old friends have been very good with me, trying to understand and sticking with me through my mad patches. I feel that a lot of the support systems that have been in place in my country for decades have now mostly been taken away by our current conservative government. Funding to mental health charities has been cut enormously and to community projects that used to support people like me a lot. Mental health support has been cut a lot for people too and this huge drive to get everyone in work has been making many people with mental health conditions very ill. I feel that they could do much more, start again by funding community projects that support mental health and put the money back into people with one on one support. Early treatment I feel is very important, people having access to support before their conditions get very bad. I have been a part of community projects to support those of us with mental health issues to create Art in a safe supportive environment. The name of this project is C.A.W. (Community Arts Workshop).This has been a great place in the past to socialise and create art together, in a safe and supportive place. I have benefitted from this project much in the past. Definitely it can. Many things cannot be expressed in other ways, but by using Art, it seems to tap into the subconscious and express’s parts of us that cannot come out in say counselling or in through other means. Yes if it’s done in the right ways. Definitely. I generally always want to help and share my story and creativity to the world, to help make people understand people like me more and appreciate the value that people with mental health issues have. the world is a hard place and is made even harder for those who face stigma and unfair and non-compassionate attitudes from society at large. If I can do what I can to help lessen that burden on people, then I have done a good job. ASLI’s policies and mission statement align with mine, more needs to be done for those who suffer the most, and to try to make the world a little nicer for us all. Yes, if the workplace was more flexible and accommodating, then I believe those with mental health issues would find it much easier, also stigma puts many people off, so many find it so hard to fit into the work environment. Also many people with mental health issues are just not well enough to cope with the high demands of the workplace, I believe that these people should not be stigmatised for being unable to fit into the commonly hard fast paced work world. But I feel work, even just voluntary work can be such a benefit for people if they can do it. Volunteering has been a great activity for me over the years, being active and contributing, being part of a team can be great for your confidence and overall health and wellbeing. But people shouldn’t be made to feel bad if they cannot function well enough to hold down a job, I feel voluntary work should be more highly regarded, as also this is all that many people with severe conditions can do. In many ways my diagnosis has been a great burden when meeting new people and trying to better oneself in society, but in terms of what having a certified condition can do, is that it can work for you in other ways. People can have more compassion for you, they can have an answer as to why you have been acting so strange for example. People can give you a break when you need to back off from the world. My breakdown with schizophrenia was very destructive to my family and friend relationships and my persona in the world, but having this label has given people a reason why I was the way I was, why I acted so bizarrely and did embarrassing things etc., but then on another level, people stay away from me because of my label. It also means I can have financial support from the government and also a framework for my care givers to base my treatment upon. So all in all its a mixed bag. In no ways would I consider it less professional at all, in fact I would say that it enhances the empathy and knowledge base to run such an organisation. I believe that all companies dealing with mental health should have at least a certain percentage of the employees who have direct experiences of mental health issues. I used to be involved with the mental health charity ‘Mind’, and they have this policy too, and I believe that it adds to the understanding and better decision-making when helping and dealing with those severely affected with mental health issues. Stephen Fry is an inspiration to me, as is Johnny Benjamin who runs a popular youtube blog and he has done various tv programmes upon mental health. Marc Chagall and Patrick Woodroffe have inspired by Artistically a lot as has Salvador Dali and Giger. But mainly my inspiration is all people, for their wonderful, brilliant and mad ways. I take much inspiration from my friends, family and everyone I come across, my experiences of nature and people in general inspire me the most. But yes coming to creative people with mental health issues, then Stephen Fry for his beautiful honesty and talents in all his many areas and also Johnny Benjamin who has done some wonderful documentaries and runs a popular youtube blog where he discussed his experiences and ideas on there too. If you are interested in the art worK please contact the artist at whitecrow2012@hotmail.com. Previous Indian visual artist Sravanthi Juluri speaks to ASLI, “my work has been a major source of healing in my life. I never thought my art could actually help women in distress to come out in the open about the abuse they have faced and open up a platform to raise our voices and say no to violence against women”. Next Illustrator, animator and writer Andreea Stan says art saves lives “There were situations when I felt that my art was the only thing I had and it kept me going, it didn’t let me give up”. As a schizophrenic artist myself, I was so pleased to find this page. I am encouraged by it and hope to show some art online maybe. Insider Art is very exciting to create from deep in the subconscious. Literally I feel the need to draw/paint something, then look afterward & begin to see where it is from/ what it means…. Please get in touch with us we would love to discuss featuring you, your story and your art. Best wishes.